The top diplomats of North Korea and Singapore held talks in Pyongyang on Thursday ahead of the highly anticipated summit between North Korean leader Kim Jong-un and US President Donald Trump, the North's state media reported. 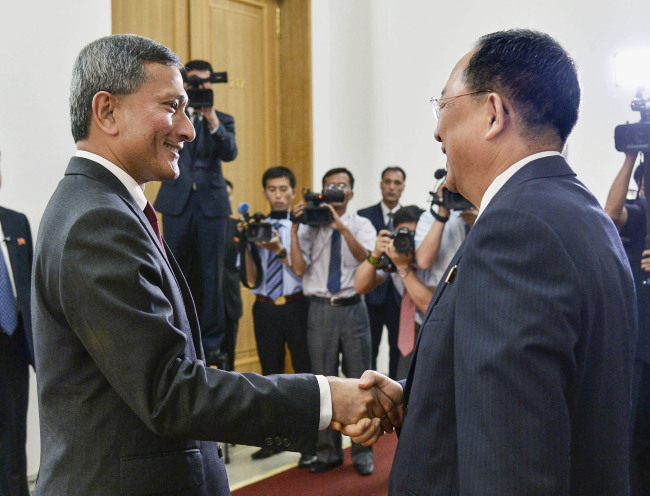 "Foreign Minister Ri Yong-ho and his Singaporean counterpart Vivian Balakrishnan exchanged in-depth views on further developing the friendly and cooperative relations between the two countries with a long history and tradition in various fields and on the situation ahead of the DPRK-US summit," the Korean Central News Agency said Friday. DPRK is the abbreviation for the North's formal name, the Democratic People's Republic of Korea. Balakrishnan arrived in Pyongyang on Thursday for a two-day stay. His trip to the North is seen as an effort to fine-tune with North Korean officials details on security and protocol arrangements for the summit that is to be held in Singapore on Tuesday.